Everest Google Places Reviews is one of the best premium WordPress plugin to showcase Google Places and business reviews and also allows you to display up to 5 business reviews. A standout amongst the most powerful reviews display platform with 10 pre available templates for business reviews with user rating and 10 pre available badge for displaying business information. Display your business google places reviews to attract more reviews for local business. If you have multiple business, then you can simply create multiple business reviews with different location and showcase it on specific page or post using shortcodes. – Create multiple google places reviews with different locations and set its specific data separately. Feature to check the preview on backend. – Autocomplete feature available to search your specific business location and simply grab its location id and name automatically to be displayed on required fields to fetch google places user reviews and business information with the help of its location id. – A Powerful reviews display platform with best 10 pre available templates for business reviews with user rating and 10 different available badge templates for displaying business information and header as ribbon. Display your business google places reviews to attract more reviews for local business. – You can enable Floating Review, set default floating review from multiple google location lists. – Choose any template layout among 5 for floating review. – Set floating review position as top left, top right,middle left, middle right and many more. – Show review on specific pages, post or only on home page. – Assign reviews as floating review separately for specific post or pages from its specific edit page. – Set up the cache period on how often the latest reviews should be fetched from API. – Set total number of user reviews options. Upto 5 google places user reviews can be displayed. – Configuration settings for rate us button to write a review which will linked to review submission form for specific business location. – Create multiple google places reviews with different locations and get its shortcode. Display your business reviews on any page or template easily using shortcodes. – Unlimited customization options to set your own custom design. 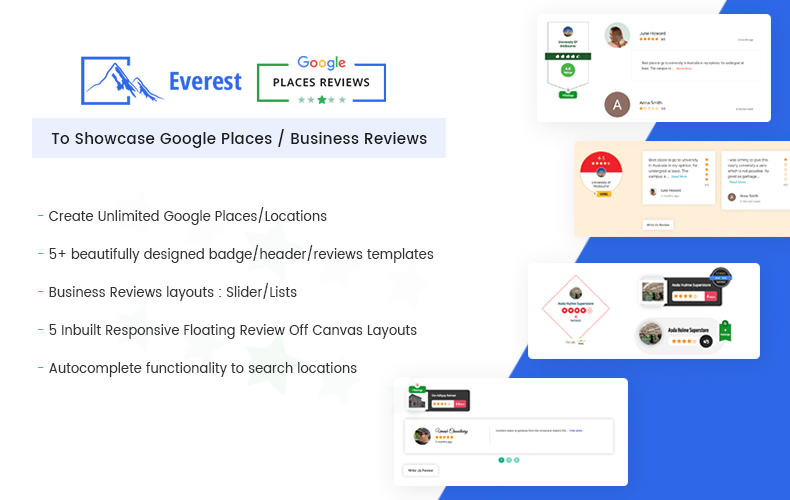 Hey Buddy!, I found this information for you: "Best WordPress Plugin To Showcase Google Places / Business Reviews – Everest Google Places Reviews". Here is the website link: https://access-keys.com/wordpress-plugins/everest-google-places-reviews/. Thank you.